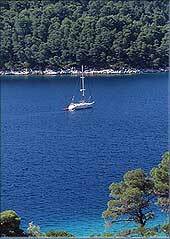 Skopelos, the second largest island in Sporades, is 60 nautical miles from Volos. 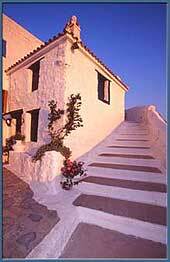 It's a picturesque island with lots of water, wonderful beaches and white houses with green-blue roofs. It is also very fertile vines, olives, almonds, pears, citrus fruit and plums for which the island is famous are grown. Although the island has a remote feel to it, in summer visitors who come from Skiathos for its splendid beaches invade it every day. Recently archaeologists discovered evidence of a Cretan settlement, which makes Skopelos the most northerly Minoan site so far, unearthed. 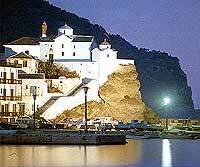 Skopelos, was known by the name of Peparithos. It was a colony of Minoas and it's said that he was the first who came to stay and became king of the island was Stafilos, son of Dionysos and Ariadne. A grave that was found in 1927 in the location of Stafilo is believed that is his. Skopelos has lovely beaches, shallow and safe waters ideal for children too; at Stafylos Cove, Limnonari -- to which you cross by boat from Agnondas, at Panormos, a wind protected bay: at Milia and Elios, and at Loutraki, the Glossa port. For those who enjoy a shingly beach there are Agios Konstantinos, Sares. Kastri and Glisteri. Many of these beaches have pine trees reaching down to the sea. An also worth visiting place is the Tripiti grotto. Buzukia, discos, bars and pubs can be found in Hora.